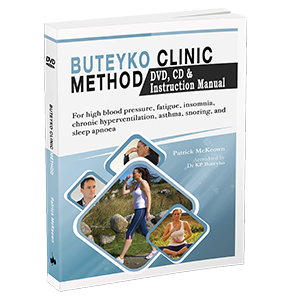 Includes DVD (90 mins of direct video training in Buteyko theory and exercises), CD (20 mins Audio training in Buteyko breathing) and Book Manual ‘Shut Your Mouth’. Practice alongside internationally acclaimed author and Buteyko practitioner Patrick McKeown as he guides you through the Buteyko Clinic Method with easy-to-understand instructions and practical demonstrations. The key to improving body oxygenation is not taking ‘deep breaths’. In fact, you should be doing the complete opposite. 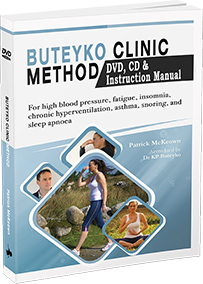 Learn how to improve blood circulation and increase delivery of oxygen in the body with simple reduced breathing techniques and enjoy better lifelong health. Breathing re-education targets the root cause of numerous common conditions, including stress, high blood pressure and sleep-disordered breathing. 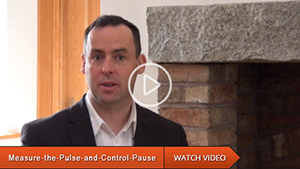 Reduce and eradicate symptoms with gentle breathing exercises that can be easily incorporated into your daily routine. 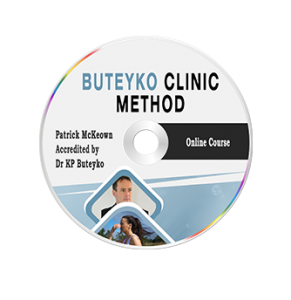 The Buteyko Method is fully accessible and highly effective, producing noticeable results in as little as seven days.